When shopping for sirloin tip, do not confuse this with the top sirloin. Although both contain the name sirloin, these are different cuts. Sirloin tip is situated on top of the hip or the round. Higher up this cut is the cut called top sirloin. Now this top sirloin is joined with the short loin. This translates to a top sirloin being tenderer as compared to the tip. This sirloin tip has a horse shaped cut. It is lean and economical. This can be made into kabobs, stir – fry, cube steak, stew, cutlets (or fast fry), to name a few. A lot of cookbooks contain recipes involving the sirloin tip because it has plenty of uses. Considering its lean cut, it tends to be chewy and dry. The best way to tenderize this piece of meat is to marinate it before pan – searing, broiling or grilling. The period for marinating can range from six hours to an entire day or twenty – four hours. The first step is to trim off the excess fat. Then, combine together with the marinade according to the recipe. For the best steak, put the sirloin tip inside a resealable food bag made of plastic. The marinade inside the bag must measure from half a cup to one cup or 250 ml of marinade. Make sure to squeeze any extra air from the bag. Put this bag in the refrigerator for around six hours up to an entire day. Using the resealable bag lessens the mess and at the same time, you can occasionally swivel the bag around slightly to ensure that the marinade is distributed evenly. One can also make use of plastic, glass containers, stainless steel, with lids to marinate the meat. However, do not make use of tinfoil or aluminium. 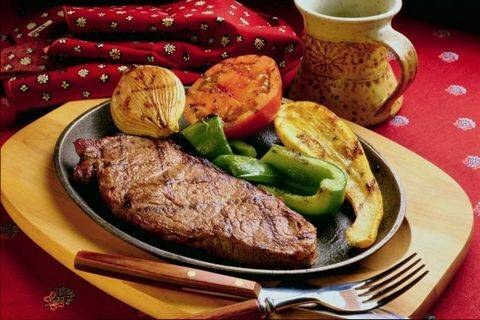 One hour before the time for grilling the steaks, remove the meat from the refrigerator. This ensures that the steak is at room temperature. Separate the meat from the liquid marinade. Blot the steak dry by utilizing some paper towels. The next step is to season the meat with pepper and salt. To prevent any sticking, lightly brush the grills with vegetable oil. If one is working with gas grills, preheat it on high for a period of ten minutes to fifteen minutes. The lid must be kept down. With a grill brush, scrape the grill clean. The heat must then be adjusted, setting at medium high. The steak must be cooked at a temperature of 135 degrees for medium rare or 145 degrees for medium. Anything greater than said temperatures will result to a dried out steak. Turn the steaks once. After the steaks are removed, tent the steaks with foil for a period of five minutes to ten minutes. This allows the redistribution of the juices evenly throughout the entire steak.